Gold Pack – $29.99 / mo. 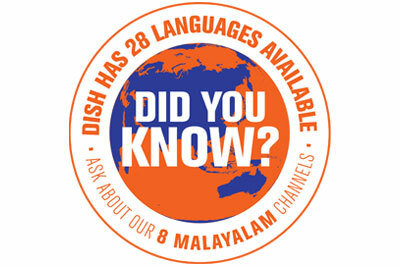 PRIMARY MALAYALAM LANGUAGE TV PACKAGES. *BASE DISH PROGRAMMING PACKAGE REQUIRED. Malayalam: Mega Pack – $24.99/mo. The Malayalam Mega Pack from DISH has everything you could possibly want from popular Malayalam programming. The diverse group of channels includes movies; talent, music, and dance shows; up to date news; reality shows; serials; comedy shows; and much more! To order the Malayalam: Mega Package, contact your friendly DISH representative today. MALAYALAM CHANNEL ADD-ON PACKS. *INTERNATIONAL BASE AND PRIMARY INTERNATIONAL CHANNEL PACKAGE REQUIRED.